Let’s just be clear: I grew up going to public school. K – 12 “in the system,” so to speak. I’m intimately familiar with what public school is like, and was like back in the 90s (which was at least slightly better than now, before the crazy obsession over standardized testing had quite caught on). I’m not going to sit here and criticize the teachers and other officials, many of whom are doing the best they know how to do with what they have. Many are frustrated over the testing issues and feel like their hands are tied by what the system has become. This is not about them. This isn’t even specifically about the standardized testing (which is ridiculous and largely unnecessary, but that’s a topic for another day). This is really about what public school represents in our lives and what it has done to our way of thinking over the last 30 – 50 years. It’s really problematic…. The public school system didn’t mean to fail. In fact, all of what I’m about to describe was done with the absolute best of intentions. They’re still doing a lot of bad things with the best of intentions. But sadly, something as important as education can’t be judged by its intentions; it has to be judged by its outcomes. I grew up in a world where…. …kids were pushed into academics early and often. Reading at 5 – 6, math at 5 – 6, writing…and so on. …kids who weren’t academically inclined, or weren’t developmentally ready at those ages, were labeled “slow” or “learning disabled” (or colloquially, among peers, “dumb”). …kids who didn’t learn the way public school taught acted out and were labeled “problem children.” Some were labeled ADD and put on brain-altering medications at age 6 – 7. …kids were sorted hierarchally by intelligence and popularity by age 9 – 10, and kids who weren’t smart or popular were social outcasts who faced bullying, ostracizing, and more. …shop, home ec, and other electives were considered “blow off” classes that smart kids didn’t take, or only took to boost their GPAs. …grades and teacher’s “marks” (on behavior, cleanliness, etc.) were considered a sign of your worth as a student and person. …college was an absolute must to be considered successful and we were all told from a young age we had to go…no matter what. …kids who didn’t have college plans were pitied or shamed, because they were dumb and would never succeed in life. …we didn’t actually have to have a reason or plan to go to college. An “undecided” major was absolutely fine. That’s all fine and dandy. I mean, come on. We do want people to be successful in life, right? We want people to be well-educated and have good jobs and be able to take care of themselves. And the world is changing! …many adults never finished their degrees because they simply didn’t know what they actually wanted to do with their lives at age 18…or 20…or 22. …many adults who did finish their degrees regret going into 10s of thousands of dollars in debt to do it. …many adults do not use the degrees that they got. …many adults later went back to college or to trade school once they actually figured out what they did want to do with their lives. …many adults do not remember most of what they “learned” in school anymore, and some feel woefully under-educated on important topics. …many adults are trying to overcome the shame and anger over being labeled “dumb” because they did not fit into the typical public school model. …many adults do not know basic life skills, like cooking, how to open and use a bank account, how to pay rent, how to get a mortgage, how to write a check, how to sew on a button, etc. Some communities are now teaching “adulting” classes to people in their 20s and 30s. …some adults still don’t know what they want to be “when they grow up” even though they are now in their 30s. …some adults are still struggling to even know how to learn things on their own and be self-motivated and self-directed because they never got those skills when they were younger. …some adults are depressed, anxious, or emotionally struggling because of bullying they faced as kids, and will be struggling for the rest of their lives to get over it — but they probably never will. This is Clearly a Failure…. I don’t know about you, but I can see clearly that this little “experiment” was a failure. We have fully-grown adults who don’t remember anything they “learned” in this rigorous, early-academics, test-based environment. We have adults who still have a complex over having been “dumb” as a kid. We have adults with no actual life skills, or who feel very uncomfortable with some life skills. I mean, honestly. The goal was to have highly-educated adults. That part failed because we all forgot so much of what we learned. And we pushed academics heavily at the expense of life skills, so we don’t have those either. How could this possibly be worse? Just throw a little of that good ol’ “public school socialization” in the mix, and you’ll see how it can be worse. It’s like we’ve just decided that this is what it is, and there’s nothing we can do about it. Kind of how many of us as adults now feel stuck in jobs we don’t like, that we’re not fully prepared for, because we were told that’s what we had to do to be adults. We don’t have to sit back and be victims. We don’t have to defend a broken system. We don’t have to perpetuate this system and allow our children to go through the same thing — only worse, because there’s an even harder and earlier push for academics, fewer elective/creative classes, and more standardized testing. Everything that was good about the public school system has nearly gone away in many areas. I want better than this for my children. I want them to have a better academic experience. I want them to learn needed skills (like math and reading) in their own timing and at their own pace. Is it going to matter if they read when they’re 5 or when they’re 10? In the long run…no, it won’t. I won’t tell them they’re a genius and they’re better than everyone else if they read at 5. And I won’t tell them they’re dumb and doomed to a life of mediocrity if they read at 10. I want them to have a broader learning experience. Who says that only literature, math, science, and history are important? Who decides which parts of those kids “need” to learn and in which ways? (These are all the parts we forgot, anyway — all that ‘extra’ stuff we had no interest in.) I want my kids to follow their own passions and dive down into rabbit holes and learn things they’d never be able to find in school. I want them to have a chance to really explore those subjects and ideas when they’re young, so that they might actually have some clue of what they really love when they become adults. I want them to know that arbitrary standards and grades don’t matter. Those are someone else’s opinion of how you’re doing in life. It takes some people longer than others, and everyone has a different learning style. Some things are easy for one person, but very hard for another. All of this is very much okay. I want them to be able to think creatively and solve problems. Frankly, any gaps in actual facts/knowledge can be made up at any point in life, but adults who haven’t learned to think outside the box, solve their own (or others’) problems, or developed self-discipline will really struggle. An adult who knows how and where to gain knowledge and has the self-discipline to ask the questions and find the answers will do just fine. I want them to have authentic social experiences. This means with people of all ages, from different cultures and backgrounds, with different ways of thinking. I want them to have the value of an experienced adult who can help mediate disputes, where needed; but also for them to learn to mediate disputes on their own. I want to help them identify inappropriate or bullying behavior (in themselves and in others) and stand strong against those behaviors…as well as learn how to modify their own behavior to better respect others. I don’t see these things happening in the public schools right now, so that’s not where my kids are going. I think that some of these things can happen within a public school framework if parents are vigilantly involved in the schools as volunteers and also at enriching their kids at home. I think parents who choose public schools, for whatever reason, should push for positive change in their communities. This, again, is not a tirade that no one should ever go to public school. For some, it’s just what’s necessary. For us, homeschooling better fits our lifestyle and goals. I had to write this, as a homeschooling parent, because so many public school parents do get defensive at times and try to defend the public school system where it doesn’t deserve defense. This is important because a lot of people try to measure “alternative school choices” against the public school system, as if it’s some kind of highly successful standard that these other choices need to meet. Please just stop doing that. The public school system is not a high standard. In fact, it should be no standard at all. As parents, we need to look outside all of the schooling methods and think about the ultimate life goals we have for our children. Then, we find the educational experience that best fits those life goals. It should never be a question of public school as the “standard” and everything else needs to be like it. Far too many parents who are questioning the available educational choices and are seriously looking at alternatives are held back by this idea that public school is the standard to meet, and are afraid that by making another choice, they will fail their child. They want to homeschool, or unschool, or choose a hybrid or private school, but are so afraid that they won’t meet the “benchmarks” for educational success that have been set by the public school system. Stop thinking of the public school system as your standard. As I’ve pointed out above, it has plenty of long-term failures. Instead, define your own terms of “success.” Talk to other parents who have chosen an alternative education for their children and ask what their version of “success” looks like. But mostly, stop being afraid. It’s easier to put your trust in “professionals” and just let them tell you what is normal and what is best in life. It’s easiest to not take responsibility for failure because you did what you were “supposed to.” But it’s not best. Not at all. Learning doesn’t end at age 18 or 22 or whenever you finish formal schooling. It doesn’t begin at age 5, when you first start formal schooling, either. Learning begins the day you become aware while still in the womb, and ends the day you die. “School” is only one small snippet of the learning you’ll do in your whole life. Please, step out of this mindset with me. Think outside the box. Choose a path that really works for your personality, needs, and life circumstances. Don’t let anyone else or anything else be your standard. 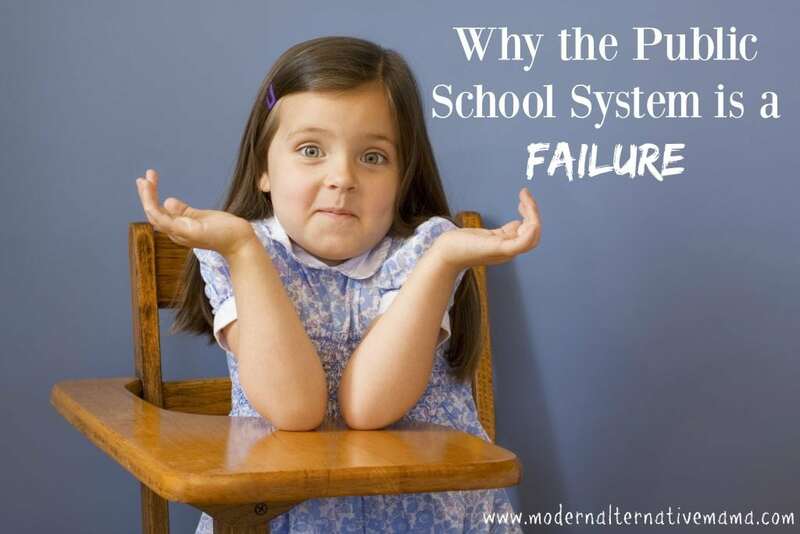 Do you think the public school system has failed? Why or why not? In all honesty I agree. I was in gifted from a very young age and it burned me out. I finished 2 years of college and did nothing with it. We have three kids and homeschooled the older two until recently. Why? Well the older child is ahead of her peers and the youngest in her class. He younger sister completed K last year at home and when she was presented with 1st grade materials this year she just was not interested. Mind you she was 4 and turned 5 in Oct. We backed off and she recently enrolled in PK at a public charter school. Again Why? Well, they are enjoying the social aspect of it all. They had up until recently lived very rural and had almost zero social interaction outside of our family. Nothing wrong with that but I will not deny them when they ask to attend school. We have applied to a Christian private school for next year but the costs even after scholarships will eat out family alive. We have decided to let them go to public school again next year and work very closely with their teachers. We do not celebrate holidays that do not follow in Christ’s footsteps and we will have to adjust their science curriculum. In the end I think it is our duty as parents to give our children strong foundations and then monitor and adjust for each child. I heartily agree with everything you say except that it was and is all done “with the best of intentions.” The architects of our modern educational system, who incidentally are the same people who built and oversee our medical and factory-farm systems, do not have anything but their own good in mind. They want to turn us into submissive slaves, and in large part have already succeeded in doing so. But the exceptions are the hope of the future. I fully agree! I was homeschooled, and homeschool my children, for all of the reasons you listed. Thanks for being a voice. Amazing post keep it up. To the author of this article… if you haven’t already, please read “The Deliberate Dumbing Down of America” and “Education, Free and Compulsary” both books can be downloaded online for free. They were written by very educated individuals and will give you a very eye-opening experience. You will learn the history of education in schools throughout the world over the past several centuries, and you very well may change your opinion that education was set up with the “best of intentions”. Any homeschooling parent will benefit from reading these books. I was homeschooled & then went to private school & I feel the same exact way you do about public school. I was bored AF, was never taught any life skills, and pushed into college with no clue what I wanted to do with my life. Idk if public school is the problem & homeschooling is the solution. They can both be done badly. Anyway kudos to those parents who are trying to give their kids something better than they had!